See Bird on Blossom raku tile mosaic here and Two Blossoms here. Turns out that these wall art pieces were birthday and Christmas gifts for one of our clients who so generously shared these pictures of them in place in her beautiful home! It makes us happy to see the many different homes where our artwork resides. We love getting pictures from our customers showing where our art work finds its new home! Here is a very pretty New Hampshire kitchen with our Suzani Patchwork clay tile mosaic wall art fitting right in! We look forward to seeing how our new Arabesque Canister Set looks when it arrives too! We are so thrilled to have our Jubilation Small Canister featured on HGTV's David Bromstad's list of favorite canisters in the November 2017 issue of HGTV Magazine! Just snapped a couple of quick photos of a project we just finished up and are carefully packaging to ship to Texas. The colorful tile panel will be installed as a backsplash feature in a breakfast room. Below are the coordinating wall tiles that will be scattered randomly in the adjacent laundry room. This truly was a fun project for us. Here's the working sketch and start of another custom piece we are currently working on. The client has fond memories of a California trip and was struck by the blue birds seen there. A pair of blue birds will be incorporated in this piece. Custom wall art for a local friend. What a pretty home for this piece... it is really satisfying to see where our art work ends up! We had a lot of fun making these ornaments for the Laughs for Love fundraiser for the Ronald McDonald House Charities of the Ohio Valley which takes place Saturday, March 4th here in Jasper, Indiana. Many thanks to the big help from a few girl scouts from Ireland, Indiana Troop 329 and a few cub scouts from Ireland, Indiana Pack 130 who helped turn out these fun ornaments for tomorrow's event! Find more info on the event here or on facebook here. Another of our Sticks has made a home in this very welcoming family room in Virginia. This time in a horizontal orientation. We love how it helps marry all of the room colors together and feels right at home above the fireplace. We love getting customer photos of our artwork in their new homes! Our Stick Wall Art made its way to this beautiful Bay Area California kitchen! We were contacted last fall about doing a custom mosaic wall art piece featuring St. Francis. We think he looks great in his new home! The process started with a few emails discussing design elements and then we presented our client with a sketch to approve. Then we brought the sketch to life in raw clay. Then the pieces went into the kiln for the first firing. Below the pieces were reassembled and ready to receive coats of underglaze. Here is the reassembled piece again after its second firing. And, below, shown prior to grouting, but after raku firing and mosaic embellishments. And, here is the artwork in place. What a beautiful home! 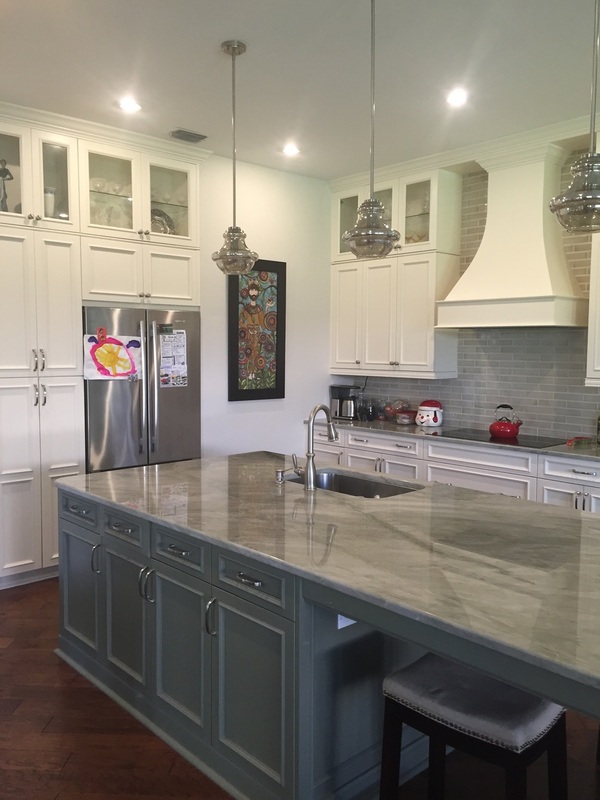 We really enjoyed working on this project and with such a great client! See more of our mosaic wall art here. Wrapped up on some glazing yesterday of some little magnets and tile art. After they come out of the kiln this morning, we'll put on the finishing touches and they will come with us to the Wild Women Wearable Art show this weekend. It's a two city venue starting in Louisville, KY, Friday and Saturday, February 5 - 6 and then onto Indianapolis, Sunday, February 7. This is just one of those stories we love. We received an order for this little red bird on two blossoms a while back. Our customer shared her photo with us that her home has a backyard that attracts beautiful red cardinals to her feeder daily which is what inspired her to add our artwork to her home. Thanks Elite16 for the fresh feature on the blog today! And thanks to Pat of Giardino for styling this pretty collection! Visit the blog here. A big Thank You to the Elite16 for the wonderful feature on their blog! We are in great company! Check it out here! Clare carving out the clay for one of our crosses. Finished cross after firing and raku firing. Part of why we love coming to work everyday is that we get to play in the mud. It just never gets old! We rolled out a slab of raw clay and cut it into a cross and, in the first photo, you see Clare carving away the clay to create the pattern that gets glazed with color. In the second photo you can see the smoky pattern and iridescent crackling left behind by the raku fire. We are fascinated by the beautiful colors, textures, and patterns found in Suzani textiles. 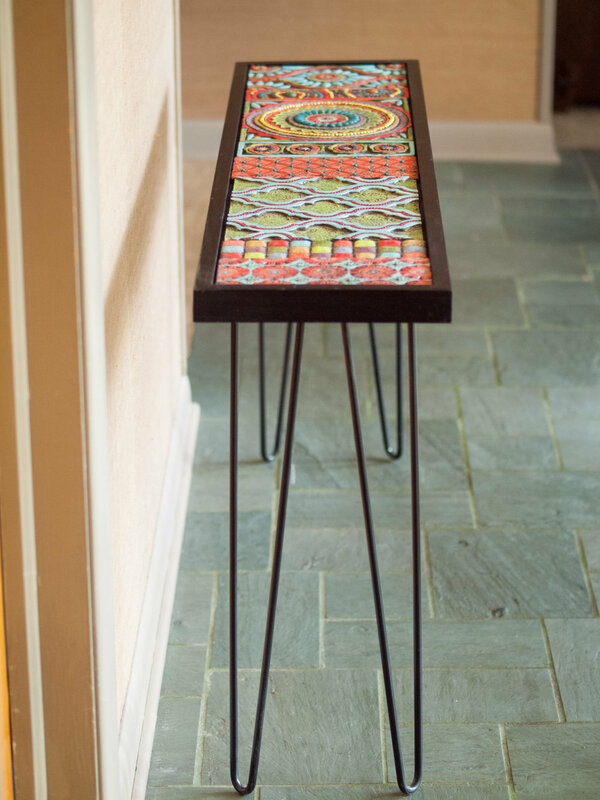 Inspired by these wonderful textiles, we added our raku fired clay tile pieces and semiprecious stones to this locally found vintage table in order to create this intricate mosaic. We think it would be a pretty statement piece at the end of a hallway or maybe would be a nice addition to a screened porch. Mirror Mirror on the Wall........Lovin' Our New Vintage Haul! We found this second empire style round mirror at a local resale shop and worked our magic on it. We gave it a fresh coat of paint and embellished it with a custom clay tile that we raku fired and topped off with semiprecious stones (coral, jade, purple amethyst, turquoise, carnelian) and grout. See more info about this piece here. Here is our Red Table Before and After its transformation! The design on each piece is freehand drawn. Then the texture is carved and stamped into the clay. Romy painting on the several layers of glaze. Setting in the semiprecious stones and beads to create the mosaic. Grouting...it's gotta get worse before it gets better! Setting the tiles into our great find - the vintage red table. Nature, texture, and color inspire us both. We love to incorporate these elements in our work by combining carving, stamping, raku fire, mosaic, and a bit of whimsy to create beautiful things. We are Romy Kissel and Clare Backer Bies and we happily come each day to our studio, a 100 year old grainery, in our mid-western hometown of Jasper, Indiana.